THE CODE had a soft start. CBS: After a steady 1.1 for NCIS, THE CODE had a special premiere airing before moving to its regular slot next Monday, and launched at 0.7, down 0.2 from last week’s FBI. 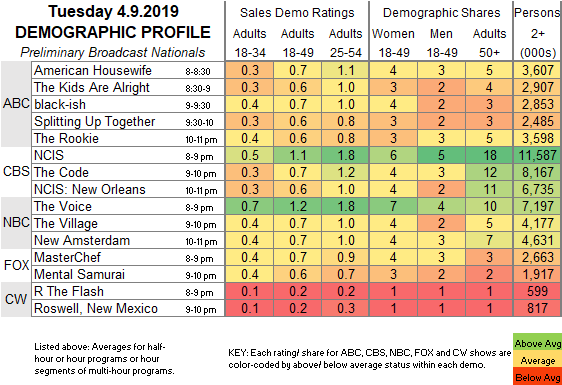 With that lower lead-in, NCIS: NEW ORLEANS dropped 0.2 to 0.6. NBC: A Tuesday installment of THE VOICE was at 1.2, leading into the timeslot premiere of THE VILLAGE, which was steady with last week’s 10PM airing at 0.7. However, that gave NEW AMSTERDAM a lower lead-in than it had with THIS IS US, and it fell 0.3 from its last episode on March 12 to 0.7. ABC: Returning from a week off, AMERICAN HOUSEWIFE was down 0.1 to 0.7, and THE KIDS ARE ALRIGHT was steady at 0.6. BLACK-ISH (0.7) and the season finale of SPLITTING UP TOGETHER (0.6) held last week’s numbers. THE ROOKIE lost 0.1 to 0.6. FOX: MASTERCHEF JR (0.7) and MENTAL SAMURAI (0.6) were steady. CW: Returning from a rerun week, ROSWELL, NEW MEXICO remained at 0.2. It was preceded by a rerun of THE FLASH at 0.2. 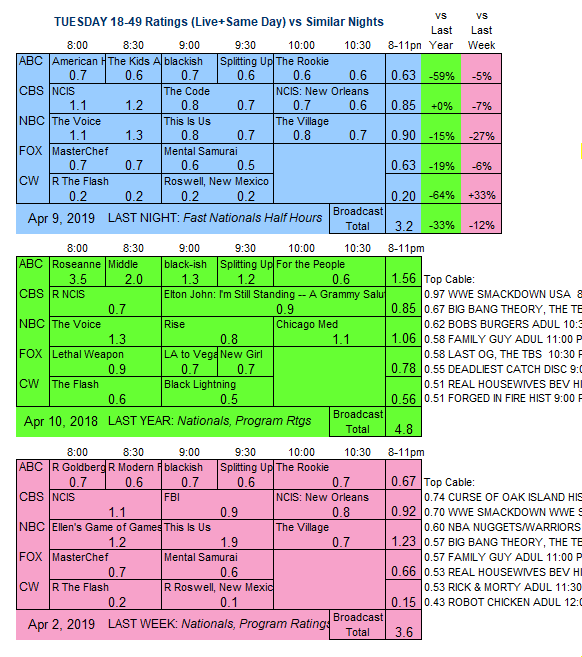 With MILLION DOLLAR MILE derailed to Saturdays, CBS will air a rerun of NCIS in the 9PM hour tonight.